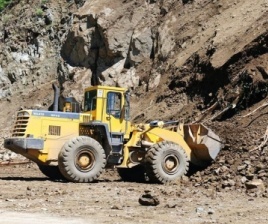 TBILISI, DFWatch–Another landslide Tuesday blocked the main road that connects western and eastern Georgia. The first landslide damaged the road through Rikoti Pass on June 12, but the pass was cleaned and reopened after a few days. Tuesday morning a second landslide landed soil and rocks onto the Tbilisi-Senaki-Leselidze road, which had to be closed again. It is now closed for all kinds of traffic along the 136-152 kilometer section. Drivers may make a detour along the Gomi-Sachkhere-Chiatura-Zestaponi bypass, but trailers and semi-trailers are prohibited from using this road. Clean-up work is ongoing in Rikoti as geologists from the Environment Ministry are studying the environment to find out when it is safe to resume traffic through the tunnel and how big the risk of another landslide is. Last time traffic through Rikoti was closed, June 12 to 14, Georgian Railways offered free train rides until the passage was reopened.